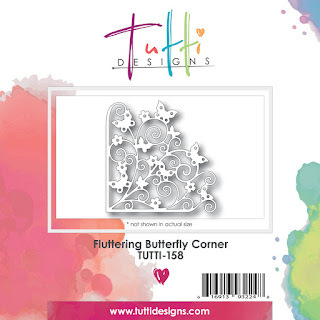 I used the fabulous Fluttering Butterfly Corner die for my card. I die cut it from White card stock and then colored it with Copic Markers. After that I covered the entire cut in Versa Mark ink and added Clear Embossing Powder, heat setting it all. I love doing this to a colored die cut. It makes for a lovely look. Added a FAB sentiment and some matching Enamel Brads to complete my look. BEAUTIFUL! Love the coloring on this pretty corner die and I'll have to give that 'clear embossing' technique a try. Great idea ... bet it looks awesome IRL. Thanks for wonderful inspiration! This is so pretty, Donna! A really happy card with the color combination that you used!